1899: Original blacksmith shop is built and production of wrought iron fixtures, andirons, and hinges begins. 1902: The Copper Shop is built and production of copper fixtures, hinges, etc. begins. 1904: Dard Hunter arrives at Roycroft. 1906: The first commercial Roycroft copper items (simple letter openers, pin trays, etc) are produced for sale. 1906: Karl Kipp begins work at Roycroft in the Bindery. 1909: Walter U. Jennings moves from the Bindery to the Copper Shop. 1910: Former banker Karl Kipp joins the Copper Shop. 1910: Kipp and Hunter collaborate on some Roycroft copper designs -- "early" Vienna Secession-influenced style emerges (geometrics, cutouts, silver overlays). 1910: Dard Hunter leaves Roycroft to pursue paper making career. 1911: Kipp begins his own copper business while still employed at Roycroft. 1911: Kipp's wares are first advertised in The Fra. 1911-12: Italian polychrome line is introduced by Jennings (caramel colored copper with green paint highlights). 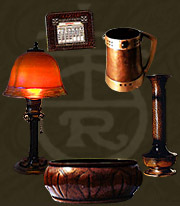 1912: Roycroft receives huge commission for copper items for the Grove Park Inn. 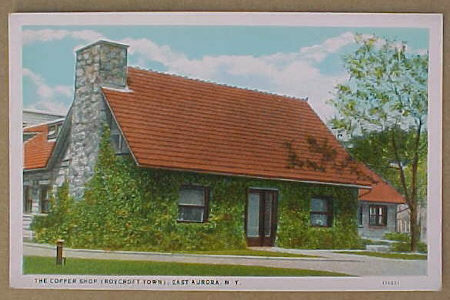 1912: Kipp leaves Roycroft to found the Tookay shop. 1912: Jennings leaves Roycroft to join Tookay Shop. 1912: Victor Toothaker is working in the Copper Shop (decorative rivet style emerges -- he may have designed the American Beauty Vase). 1913: West Wing is added to the Copper Shop. 1914: Art Cole is employed at age 16 at the Tookay Shop. 1915: Elbert Hubbard dies on the Lusitania, and his son Bert takes over the Roycroft Shops. 1915: Kipp and Jennings rejoin the Copper Shop (along with Art Cole). 1916: The North Wing is added to the Copper Shop. 1916: Jennings makes Roycroft-like items at home and signs with his own mark. 1918: Art Cole joins the Marines and leaves the Copper Shop. 1920: Roycroft begins using Steuben glass in lampshades and vase inserts. 1921: Kipp, Jennings, and Cole confirmed all employed at the Copper Shop. 1921: Jennings still making Roycroft-like items at home and signing with another mark. 1921-1928: The "golden age" of Roycroft copper production. 1928: Bert Hubbard lays off Copper shop workers. 1929: Jennings moves to the Bindery; Cole stays in the Copper Shop. 1929: Kipp and Cole resign from the Copper Shop.1929: Stock market crashes. 1930-: Small crew including Leon Varley continues production. 1930-: Quality and production decrease dramatically. 1930-31: Art Cole opens the Avon Coppersmith. 1930-: Jennings produces copper and sterling silver items from his home, some of which are sold through the Avon Coppersmith shop. 1938: Bankrupt Roycroft Shops close down. There are gaps in the above chronology, and there are several inconsistencies between sources. I would be inclined to accept the dates listed in Clark's article over those in the McConnell books where they disagree. Also, I believe that Clark has refined some of the dates listed in Head Heart and Hand.